Without the note, this dimension of the dance would be a challenge to discern as theatrical fact; however, the note's themes of feminism and of art as an endeavor with a social function, as a route to healing or emotional comfort, seemed to pervade the evening, especially when Mr. Homan referred to them directly in an affecting tribute speech to his wife's sense of mission in addressing horrific—yet unspecified—current events for her 2017 work for all eight of her dancers, No Words, for which Mr. Homan not only composed the score but played it live on a piano. 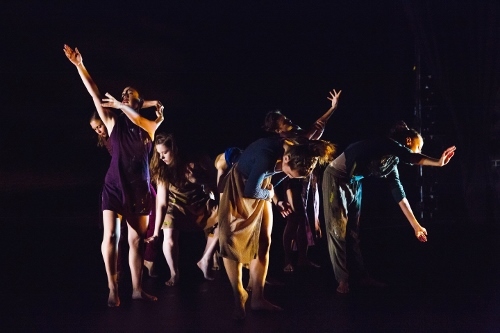 Ms Grossman's choreography for all three of her contributions on this program (including the 2011 solo Holly and the 2016 work for the entire ensemble, Variations on a Box) present her dancers carefully as quasi-dramatic figures who veer between energizing action and vulnerable acceptance or sorrow. 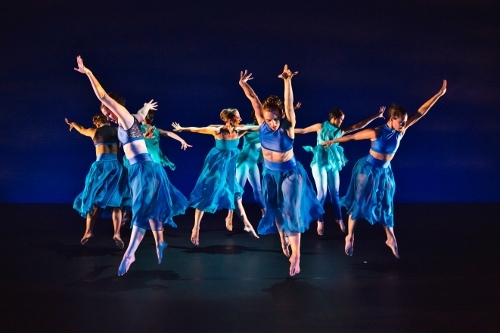 They can jump and even cavort; however, the afterimage of them is of gravity and a heavy tread, and the humanism that seems to be the choreographer's major focus somehow makes choreographic surprise difficult to achieve. 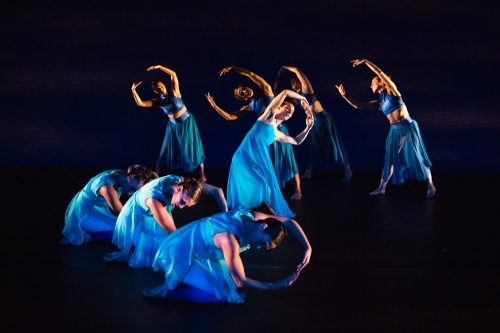 The two recent ensemble dances feature some elaborate lighting by Marika Kent, including light designs for the floor, which add visual interest of a graphic nature to the well-intended yet formulaic relationships and emotional expressions. One wants to like these dances but, in this reviewer's case, to reach that goal demanded mental labor. For the anniversary season, the Paul Taylor enterprise contributed a vest-pocket version of his 1997 modern-dance milonga, Piazzolla Caldera, performed by six dancers of Taylor 2 in a staging overseen by the group's rehearsal director, Taylor star alumna Ruth Andrien, and enhanced by visits from members of Piazzolla's original cast, who—Andrien said in an intermission conversation—explained to the current young executants the reason for being, dramatic and musical, of each step and action. I happen to enjoy Piazzolla, and I also witnessed some of the rehearsals in which it was made. So, when I recognized that some key details were excised, in order to make it possible for six dancers to perform a work designed for twice that many, I was disappointed, especially by one change that, to me, altered the choreography's very identity. On the other hand, though, the rest of the audience was enthusiastic and either didn't notice the changes or didn't care. The reason, I think, was that the quality of the dancing was so high. 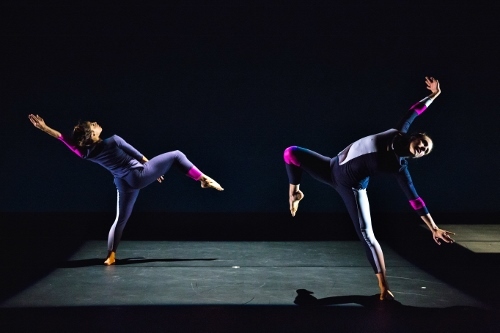 Andrien transferred her own peerless musicality as a Taylor dancer to her charges in the next generation, and the partnering in the duets, especially, was a sumptuously flowing, call and response of lightness and gravity that elevated the entire evening into high art. Ariel Rivka Dance in "Holly." 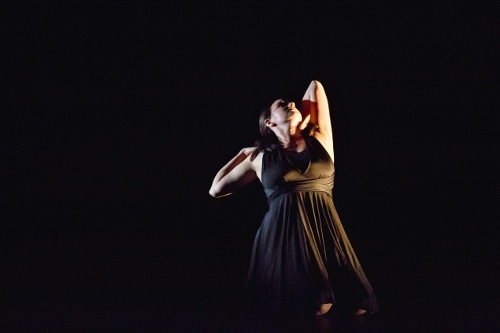 Ariel Rivka Dance in "No Words." Ariel Rivka Dance in "SUSAN." 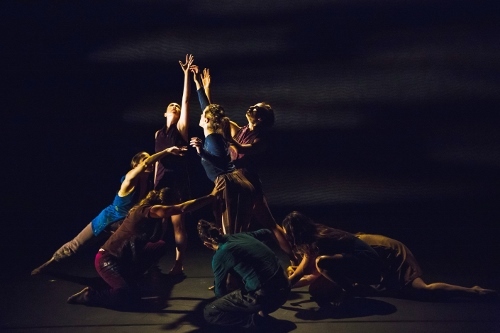 Ariel Rivka Dance in "Undertow." Ariel Rivka Dance in "Variations on a Box."